S143 has partnered with hobbyDB to provide a new way of buying and selling diecast. The fees are quite a bit lower than using ebay. And the good part is that any transaction that happens from the S143 portal nets a small portion for the forum. I have some 1:18's that I will be selling on this new platform. hobby DB has provided the following information. No siree! You are welcome to checkout as a guest. If you are a hobbyDB member, you will have the additional benefit of the item going straight into your online collection. This makes keeping a record of your collection super simple in the long run. All our payments are processed through PayPal. You can pay with your PayPal account or with a credit or debit card. We accept MasterCard, Visa, American Express, and Discover. We take extra steps in our process to make sure our buyers get their items and are happy with them before we pay our sellers. When you pay for your order, your money goes into escrow so that it is protected. This way, if you are unhappy with your order, or a seller does not deliver, you will receive a refund. This policy also protects sellers from getting taken advantage of. If a buyer is unhappy with their order, we do a full investigation into the complaint. If the buyer would like to return the item to the seller, they have five days to do so and are responsible for the cost of the return shipping. If the item is significantly different than the listing description, then the seller will be responsible for return shipping costs. After five days with no complaint, all sales are final and there can be no returns or refunds. Because we use PayPal and ensure that the payment is in escrow before asking a seller to fulfill an order, we know that money will be protected no matter what the resolution is. If there are issues with your order or a seller, please contact at the hobbyDB team and they will help you resolving the problem. If the buyer is not satisfied for any reason with their purchase, they have 5 days upon receipt to return an item to sender. Buyer is responsible for return shipping cost to the seller. A refund will be made for the full cost of the purchase item via Paypal once the seller has received said item. If an item is significantly different than the listing description, then the seller will be responsible for return shipping costs. Upon receiving the returned item, if the seller does not resolve the issue with the buyer within 5 business days, all associated costs with item purchased will be refunded to the buyer. If the buyer has waited beyond 5 days (after receipt) to voice any concerns – all sales are final and there will be no returns or refunds. If a buyer does not receive an item within a reasonable amount of days after receiving their tracking information dependent on shipping location – all associated costs with item purchased will be refunded. Because hobbyDB is powering the marketplace, to list your items for sale, you will need to have a free hobbyDB account. Simply create an account at hobbyDB.com and then search the its database for the item that you would like to list for sale. Once you find the item, you can click “Sell This” and you’ll be off to the races. For a detailed guide on how to sell your items, visit this handy dandy help article here. Items listed for sale will then show-up on the hobbyDB marketplace, the hobbyDB database and on hobbyDB powered marketplaces like this one. Well, it’s actually a super simple process from purchase to payday. We have dedicated Jedi who are here to ensure all transactions and interactions between buyers and sellers are easy as pie. What’s the deal with the marketplace fees? We pay every Wednesday. You receive payment for all items which have been delivered since the last pay-day. Once you become part of our Trusted Seller program, you will receive payments for all items that have had a tracking number added which indicates that the item will be delivered by the following Wednesday. What to do if is there is an issue? If there are issues with your order or a seller, please contact at the hobbyDB team and they will help you with solving the problem. Cool! Are those fees better than evilBay? We think forums are an important part of the hobby and take a lot of dedication to maintain (they are first a lot of fun but over time become a real burden in terms of time, goodwill and money) and that is normally all done by one or two people. We hope that you enjoy this new marketplace, both as a buyer or seller. If you want to sell please contact me for now. If you have questions or suggestions please feel free to ask me here or per PM. Either Jeff or I will announce new features and improvements. This is intriguing. I am highly aware and begrudging of eBay's 10% fee! With Paypal, one only net's 87% of the sales price! 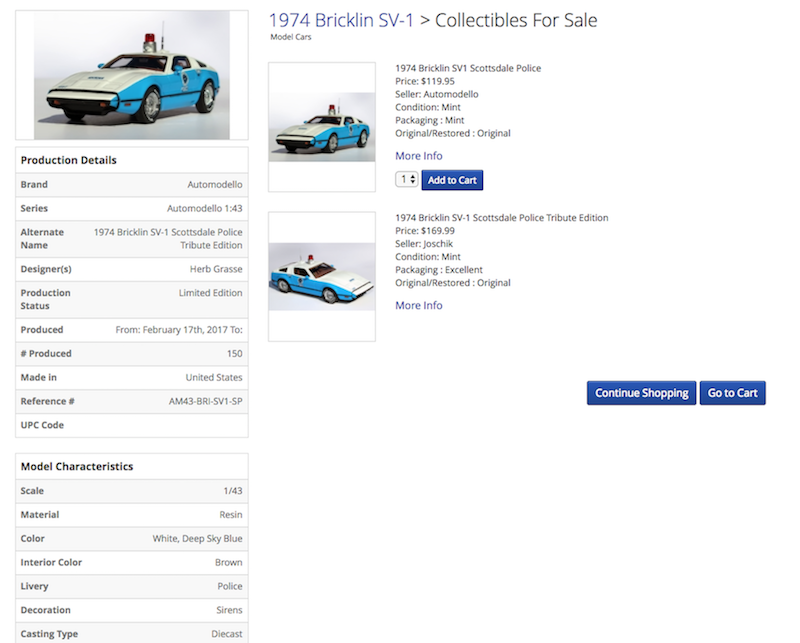 Then again, they provide a marketplace with enormous exposure, even to people that like to collect obscure 4" long cars! Is HobbyDB's 7% also collected on shipping fees like eBay? No fee on postage (we are not helping you to pack or ship the item... ). There is also no fee for our store software. And your items are sold on all of the marketplaces we run (currently 14 - you find a list here http://help.hobbydb.com/popup-marketplaces/). Please reach out if you like any help in setting up selling on hobbyDB. I belong to a photographic club which gets a commission to it's funds from Amazon when any of our members purchase any item on Amazon through a link in the club's website. It's easy therefore to understand the underlying principle behind this remote DB hook-up. Our photographic club has benefited from the association with Amazon and hopefully S143 will benefit in the same way with DB when it gets more traffic. Some photos contain the packaging showing the brand i.e. Dinky Toys or whatever but unboxed items are subject to guess work which isn't fair for newer members. It is also obvious to us older collectors that scales of unboxed items are not confined to 1:43 but again we older collectors will recognise Matchbox items. Leave opinions out of 'More details' section as some existing ads are verging on 'waffle' which isn't necessary. Only appropriate Facts of condition will do. I am on the other side of the ebay fees issue. I actually do not find them unreasonable. They are offering you exposure to a marketplace with millions of people, that should not come free. They are also offering a platform in which to pay anyone anywhere in the world. Again, that has value. Ask any business if they would be happy paying 13% for all of their marketing and for their selling platform and they would trample you to get to the desk to sign up. My problem with ebay is the way they treat its sellers. They literally side with con men and thieves. I have basically stopped selling on ebay because i got scammed on the sale of a $200 car. They did not want to hear about it, the thief got my car and his money back with their help. I have spoken with Christian about this idea for a long time and over the course of many discussions, I see this as a better way to go. There are systems in place that will deal with issues with integrity. Will they get it right every time? No, that is impossible. But both sides (seller and buyer) will get an even shake at a settlement. And that is a lot better than the current situation with ebay. The lower fees are a bonus and even better is the fact that the forum will benefit in a small way. Its small right now but it is growing and we all have a chance to be a part of it. That's a good point you raised, Jeff. How is this platform going to handle any disputes? I believe it needs to be thief-proof in order to be successful, or maybe require that user with a minimum "rating" in the platform are able to trade. Just my 0.02. Sorry, Gentlemen, that I am not as responsive as I like, I do not get notifications where there are replies. I try to check once a day and if I am not responding please email me at christian@hobbydb.com. And users can use whatever title they want to use (we will do better auto-suggestions going forward). We could use your help on the database (there are about 270 volunteers who do most of the work on it). Jeff, I cannot agree more. I have 400,000 eBay feedbacks from an earlier life and hated the way eBay treated sellers. Hi Serafa, we have developed a Trusted Seller program and all transactions are effectively in escrow. Trusted Sellers get paid when they add their tracking numbers, new and therefore not yet trusted sellers receive funds when the buyer confirms receipt or if we did not hear back 5 days after tracking shows delivery. More of that in the Help on the top left of the marketplace. All, please try it and if you have further comments we love to hear them! Buy an item and offer something for sale (all listings for sale are done on hobbyDB's database). This looks like a good choice to buy and sell our models outside Ebay. It's just needs exposure to help it grow like any other site. Thanks, Steve. Models listed here would also be listed on - so far - 13 other marketplaces (here is a list), so already get significant exposure! You mean there are other diecast forums on the net!! Hey, this is fantastic! I have a few 1:43s and a bunch of 1:18s I'm looking to offload, and eBay can be a pain if you're a buyer, too. Will be taking a closer look at this in the coming days. Cheers! If I could offer some guidance, it would be good to know who the manufacturer is of the listed models. Only had a quick glance, but can't seem to find that info unless it's in the heading. Also, I'm sure this is coming in the future but the ability to sort by make/model/manuf. or even by seller will be helpful. Are they currently descending by latest addition? Hi, sorry, just saw this comment. Re the manufacturer we are now showing this as an extra field and also made the title more flexible so that users can add their own custom titles. You can currently search for make, model, manufacturer, driver and more and should see all items (it searches the underlying fields in hobbyDB for that item) but I agree that we have to make these easier to understand. Any other comment are highly welcome.